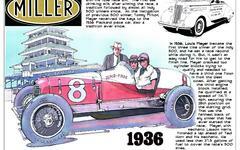 The story of Cyrus Patschke is an important but somewhat obscure piece of Indianapolis 500 history because he relieved winner Ray Harroun for about 80 miles in the inaugural race. Making a terrific contribution, he never missed a beat as he held to the game plan and kept the Marmon team in the hunt for the win. You can also read an article I wrote for the 2008 Indianapolis 500 program that talks about Patschke and other winning relief drivers - unsung heros of the Indianapolis Motor Speedway.